Why do we have Education Volunteers and what do they do? We are now looking for Education Volunteers to help us inspire our guests & education groups about the natural world and what we can all do to help make a difference in conservation. Education Volunteers help us to achieve this by assisting our Learning Officers with delivering a wide range of excellent education sessions for school groups, from ‘Why the long neck’ to ‘Wild about Wolves’ and more. Education volunteers also help us to engage with guests at our animal exhibit ‘Ranger Stations’ using props such as bio-facts, images, binoculars and games. We want our guests to be amazed by, and find out about our wonderful animals and their habitats around the world. To help us achieve this, Education Volunteers can assist us with informal presentations about our amazing invertebrate collection and what makes them unique. Volunteers also help us to look after their husbandry too! And, it doesn’t stop there! 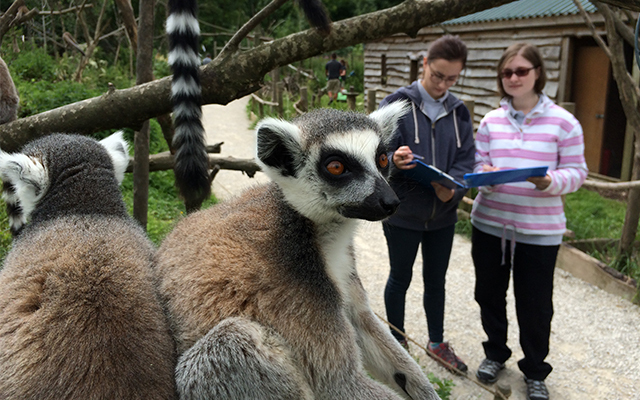 We have plenty of other tasks to assist us with, such as being creative helping us to create new education materials & interpretation signs, and helping at areas such as the lemur walkthrough. Our Education Volunteers are friendly and welcoming to our guests, and can really make their day special! Education volunteers are an invaluable part of our team, supporting us in our education work and helping us to achieve even more. A friendly person who enjoys being part of a team and will enjoy working with children and families. Someone who is keen to learn more about wildlife and is passionate about the education role of wildlife conservation. A flexible person who doesn’t mind having a go at new tasks. Someone with good customer service skills. Someone who is reliable at attending on time, on an agreed weekday. Enjoy the rewards of informing children and guests about conservation.